Avignon is on the main TGV high-speed train line between Paris and Marseille, making it easy to reach by train. Gare d'Avignon-Centre SNCF is just outside the ramparts to the south of the historic city center, on Boulevard Saint-Roch at Cours Jean Jaurès. The Gare TGV Avignon for TGV high-speed trains from Paris and Marseille is at place de l’Europe in the Zone Industrielle Courtine, 5 km (3 miles) southwest of the Gare d'Avignon-Centre. Shuttle buses (navette) connect the two train stations for every TGV arrival and departure from about 05:30 am to 23:30 (11:30 pm). 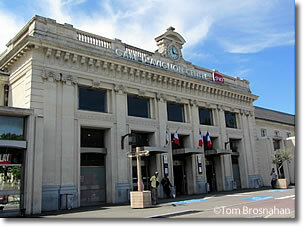 The Gare Routière (intercity bus terminal) is just to the east of the Gare d'Avignon-Centre beneath a car parking garage and an Ibis Hotel.